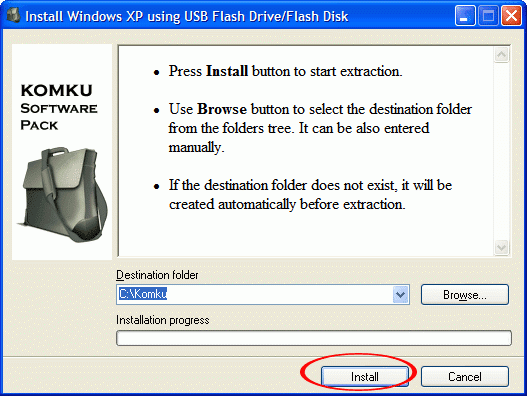 Someone asks me to write a tutorial about how to install Windows XP using USB flash disk/flash drive. 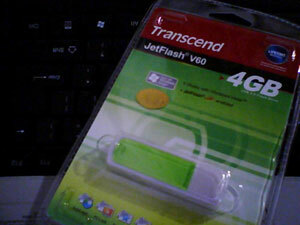 Buy a USB Flash Drive (at least 1GB). Your download at mediafire keeps timing out, any other hosts available? 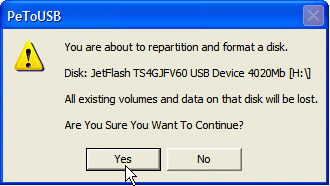 "You are about to repartition and format a disk. Disk: .... All existing volumes and data on that disk will be lost. 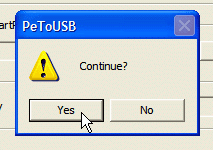 Are You Sure You Want To Continue?" Click OK, and you can close the PeToUSB window. 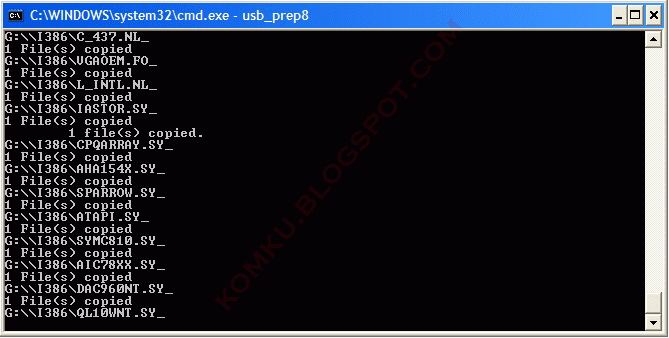 On Command Prompt window, go to directory C:\Komku\bootsect\how to do this? 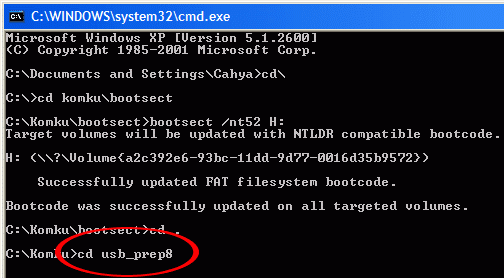 The result... "Successfully updated filesystem bootcode. Bootcode was successfully updated on all targeted volumes." "WARNING, ALL DATA ON NON-REMOVABLE DISK DRIVE T: WILL BE LOST! Proceed with Format (Y/N)?" 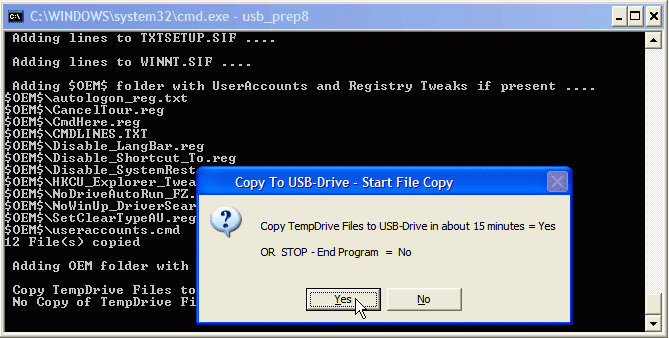 When "Making of LocalSource folder $WIN_NT$.~LS Ready"
"Copy TempDrive Files to USB-Drive in about 15 minutes = Yes OR STOP = End Program = No"
"Would you like USB-stick to be preferred Boot Drive U: bla... bla..."
"Would you like to unmount the Virtual Drive ?" 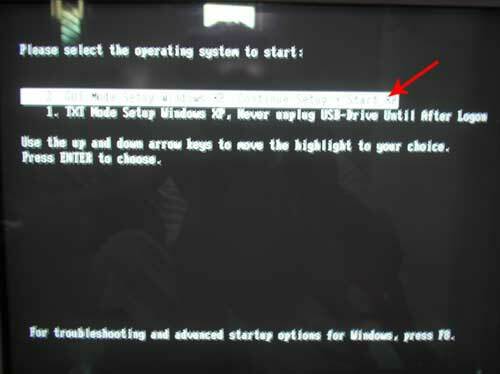 And select "TXT Mode Setup Windows XP, Never unplug USB-Drive Until After Logon"
This time select "GUI Mode setup Windows XP, Continue Setup + Start XP"
Continue Windows XP setup.... And Done! what if i use a 1GB flash drive? will it still work? 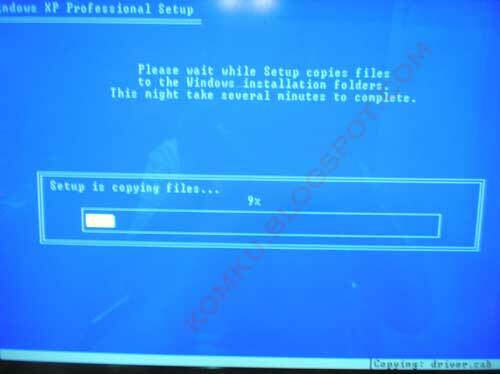 can somebody tell me how to install xp with this method in SATA HD? i finished the tutorial,but when boot up,the hdd is not showed. 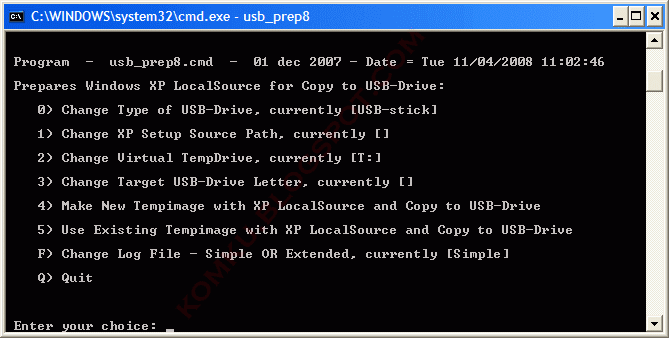 Trying to restore XPSP3 on Medion akoya MD96910 netbook. Worked fine until 99% of files copied then got: Setup cannot copy the file: iaahci.cat - giving 3 options (retry, skip, quit). Retry didn't work so skipped. Similar message for iaahci.inf iaStor.cat iaStor.inf iaStor.sys. 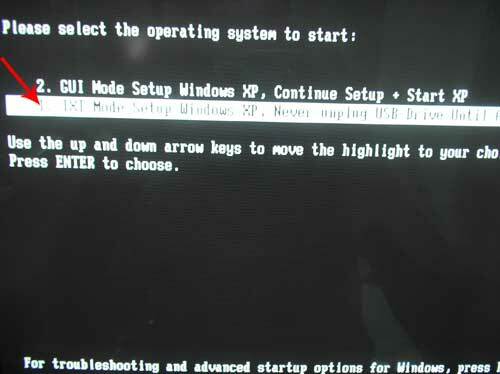 Subsequent XP Boot then failed. I do not understand why the intelSATA drivers (these files) won't load. Will try again with Netbook Bios AHCI mode set to Disable but not confident that will make any difference. Help! 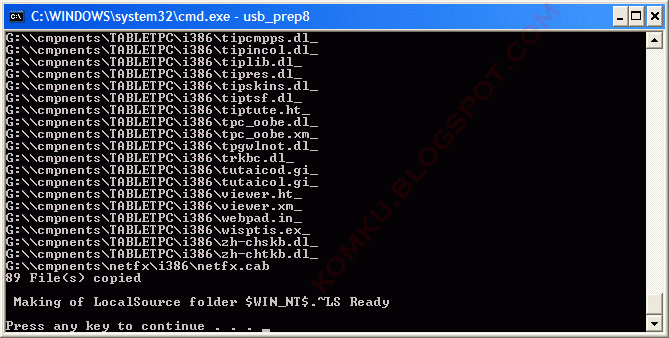 Ref: MD96910 netbook restore. With AHCI mode disabled it works without loading the intelSATA files. I assume these will have to be loaded, just got to figure how to do that now! Thanks for great install guide - brilliant. If you could put a comment about intelSATA it would be great, I cannot be the only person who doesn't understand it. 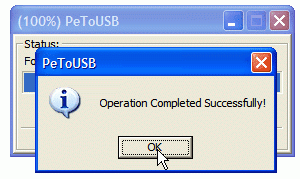 PeToUSB didn't find any removable flash drive. Please help me. by the way, I'm using Windows Vista. Easy and well written.. thanks for making our lives easier. Although I should mention that I've tried it inder Windows Vista at first and the USB Flash Driver wasn't readable at all. The whole process must be under Windows XP. Again thanks, and wish you all the best. 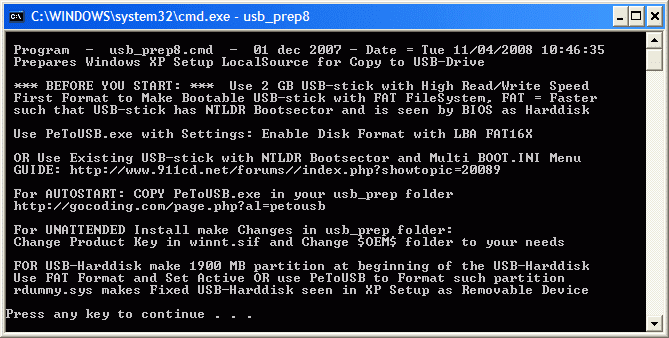 I was having the "No USB Disks" error with PeToUSB as well with by Samsung U3 (2G) and my microSD + Reader (4G) on 32-bit Vista. 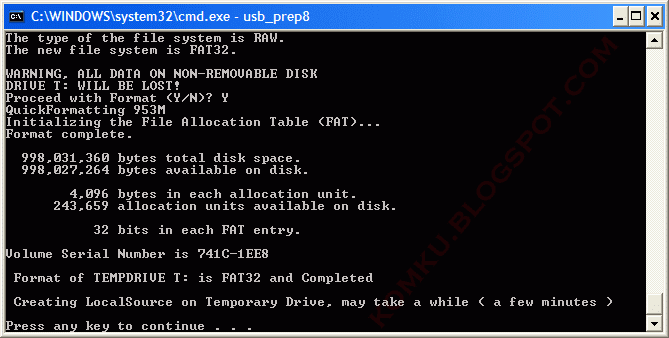 The USBs were all formatted to FAT. 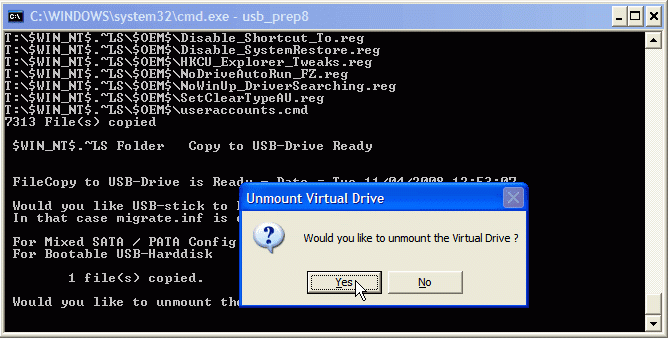 If you're on Windows Vista, try using the "Run as Administrator" function for both formatting the drive and command prompt. 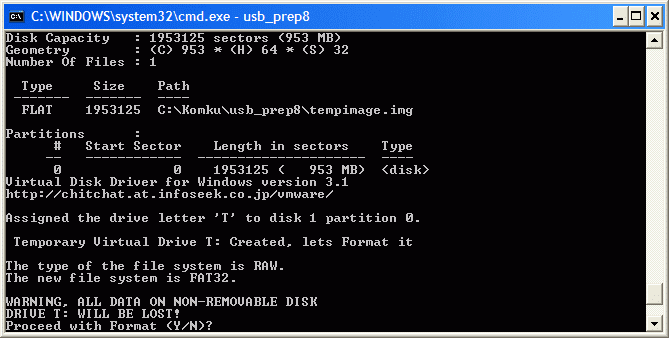 got one question though, can you use partition manager to make partitions after XP has been installed successfully using this method? Like Obama said... Yes We Can! NOTE TO ANYBODY WHO'S FLASH DRIVE CANNOT BE DETECTED... 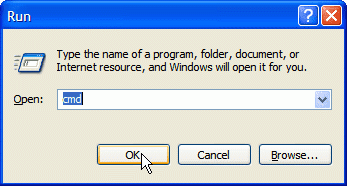 If you are in Vista or Windows 7 (Like Me) you have to Right-Click PeToUSB.exe, go to Properties, Compatibility Tab, and in Windows 7, choose RUN IN COMPATIBILITY MODE, and select Windows XP (Service Pack 3). In Vista, just do some kind of "xp" mode. 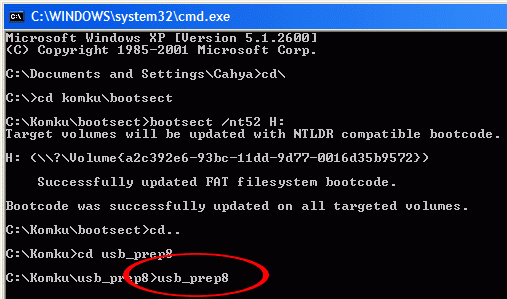 Also, in Windows 7, Command Prompt will probably give you a "denied" message on one of the "CMD" commands. Before going into Command Prompt, Right Click it (When typing into the search box in start menu) and click "Run as Administrator". "The 11 Year Old Tech Wiz"
If you found this article helpful, then please share it with someone else by using the buttons below. Thank you! © 2007-2014 Komku.org. Powered by Blogger.